I don't know if you still have it apart but if you do, I would recommend that you change the coolant hose and O-ring at the heat exchanger. 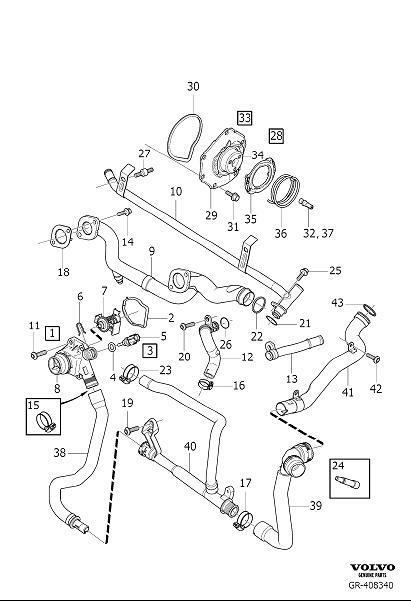 If you click on the link in my previous post (Land Rover Forum) you will see the procedure. It is very difficult to remove all of the electrical connections for the intake manifold. It might be possible to do the work without removing the manifold but I can't get my hands in there. As for the design of the Thermostat; I do wish that Volvo had made the plastic tabs larger so that it wouldn't fail at ~10 years. Having said that I do appreciate the Engineering that went into the design. And yes I agree that the Thermostat should be replaced in ~10 year intervals. If you look at my list above most of the items listed should be done by 10 years; if you want your Volvo to last 20 years. I've owned my 2008 LR2 since new and I am at 114,000 miles and I expect to get more than 200,000 miles without a major repair. In case its unclear I really like the Volvo Power-train in my LR2, Volvo reputation for reliability is part of the reason that I bought my LR2. I've read somewhere that you can get to the thermostat without removing the intake manifold but I am replacing the fan assembly as well, so I did. If you choose to pull the manifold it's not a complicated task, but getting the manifold out of the way after disconnecting it is quite an ordeal. I'll be posting pics in the cooling fan assembly thread soon, I received an incompatible fan assembly from the Internet so I'm waiting on the correct one to arrive today to finish reassemby. What is the better engine the 3.2L Ford or the Volvo whiteblock 2.5L, performance and reliability wise? Does the car go into limp mode when the thermostat fails and the temp rises or can you drive normally and warp heads/gaskets? If so, these cars can be risky used cars. I believe, it is Volvo SI6 (straight-line 6) design -- life after straight-line 5. But with $1000 worth of hoses and clamps. At the same time I bought the serpentine belt, tensioner and idler pulley. The shipping cost was $24 for everything. Shipping would have been less if I only bought the items listed above. For ~ $100 the cost of the parts shipped to my door is not significant. The cost of the Labor to do this job would be several hundred dollars. Paul, please update your checklist. 2. Brake fluid flushed (every 3 years) Volvo recommendation?